This is the story behind my Guinness World Record™ for the Fastest time to sort 30 jellybeans by straw. Many children grow up knowing that jellybeans are delicious. They are. But wait until they’re smeared in saliva and most of their outer coating has melted off – then they’re very tasty and delicious! In fact, I discovered that by mistake when I was trying to beat a British person at this world record. My jellybean-shifting challenge would be tough, but not nearly as demanding as the challenge all people are faced with right now: to stop destroying the earth and learn how to protect it. That’s something communities need to do a bit of daily, but I was only concerned with sweets right then. I’d need to move each differently coloured jellybean from a plate into a separate container – one for each colour - every half a second or thereabouts. How would I perform? There was only one way to find out and that was to assemble the tools I’d need. The same day, I began preparing my work desk. My colleagues’ indifferent reactions reminded me that I was such a peculiarity that their seeing me do something unusual is what they’ve come to expect. I cleared the papers and folders from a small area, laid out a plate and the specially cut containers, and poured jellybeans out in front of me. I’d got a new straw, because, being a lover of straws, I’d chewed the last one into a mangled strip of flattened plastic. But the new one was in perfect shape – I was relying on it to bring me another world record. Ignoring the ringing telephone, and with the resident chicken staring at me blankly through my floor-to-ceiling window pane, I filled my lungs with air, and then exhaled. I set the timer and thrust the straw against the roof of my mouth as fast as I could. With a single jellybean sucked against the other end of my straw, I moved to the left and blew out, thereby shooting the sweet into one of the assigned containers. I did it again. And again. But by the 17-second mark, half the jellybean tally was still on the plate. Fail! I rearranged all my items and retried. This went on for over an hour and a half. During my break, I thought hard about how to improve my tactic, while still following all the rules closely. It wouldn’t be easy. What’s more, the jellybeans were accumulating saliva because each time I breathed out down the straw, droplets flew out the end and sprayed all over the plate, my table and even my office paperwork. The first step was to clear my entire table and wipe down my business things. Next, I needed to calculate how to time my inhalation and exhalation with the tendency of the jellybeans to stick to each other’s moistness, and to the straw, each time air pressure caused them to shift even slightly. I’d need to breathe in more forcefully and use my cheek muscles to help me reverse the air flow in the straw at least 3 times per second without faltering on my breathing rhythm once. This was necessary if I was to beat the current world record holder, but working with such tiny times while sending myself dizzy from lack of oxygen was not a simple task. In addition, if I lowered my mouth too far, the straw could dig into my flesh and draw blood. Because I don’t want to hurt myself - or be a part of hurting a living animal for that matter, I’d need to remain alert to all my senses. A day later, I was still picking up individual jellybeans with a straw and depositing them into little containers. It was getting boring. And difficult. By then, the sweets were wallowing in a bath of my saliva mixed with their own sugar coatings which were dissolving in the frothy liquid. It wasn’t a pretty sight, but I still couldn’t resist chewing one of the sweets now and again – dripping in multi-coloured saliva. And I don’t mind admitting they were rather tasty. However, I wasn’t here to eat jellybeans, but running short after eating a few dozen meant I had to return to the shop for another packet. I’d lost count of the hours I’d invested in sorting jellybeans with a straw, and failing dismally on every attempt. The required world record speed was still far out of my reach, and my fastest times were embarrassingly slow. My coordination wasn’t as good as I wanted it to be, and I was battling to keep my eyesight focused on what the straw was doing in my finger grip. "I’ll never be able to do this", I began to think. But each time that sentence came into my mind, I replaced it with "Yes I can!" I am confident the positive thinking paid off, because – be it a freak attempt or not, I suddenly managed to sort all the jellybeans into their correct containers with ease, and very fast. Happy with myself, I retried. And the result as even more impressive! I threw my back against the chair, took a very long and slow full breath, and surveyed the action site. There was sugary saliva splattered right across my table. A pool of discoloured saliva covered the plate. 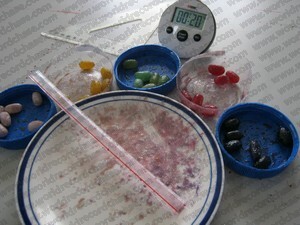 Coloured sugar was beginning to crystallise on the timer, the straw and on the sides of the little containers. I’d need to spend time at the kitchen sink cleaning it all up. But that didn’t matter because I was confident I’d done what I set out to do: beat the current world record holder. Eagerly, I submitted my evidence to the judges and kept dreaming of a positive result. And it came! Wonderful. How I just love doing this with my life. Who would want a boring Monday-to-Friday office job when they could be showing off how insane they are?